Catterwall is one of Orbulon's microgames found in WarioWare, Inc.: Mega Microgame$! and returns as one of Mona's microgames in WarioWare Gold. The name is a pun on the idiom "caterwaul", which describes an animal or person making a terrible sound. 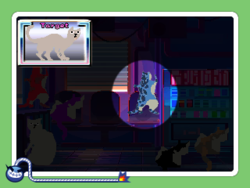 The objective of the game is to use the spotlight to find the lost cat. 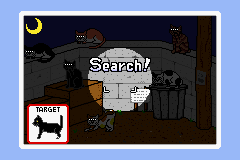 The player must use the picture of the target cat shown in the corner as reference. 1st level difficulty: There are 6 cats in the corner. 2nd level difficulty: There are 8 cats in the corner. 3rd level difficulty: There are 10 cats in the corner. This page was last edited on December 2, 2018, at 01:42.